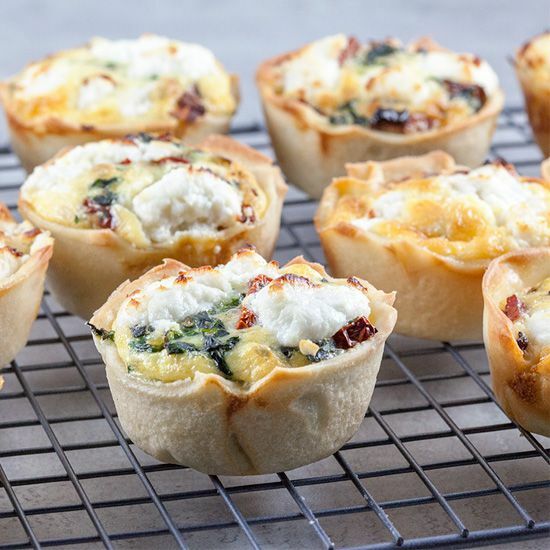 Cute looking and great tasting mini quiches. 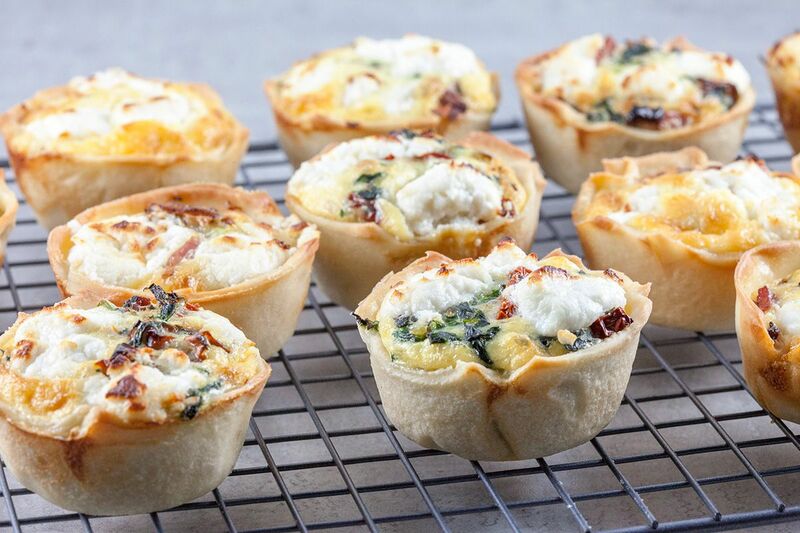 2 kinds of mini quiches, one for vegetarians and one for bacon lovers. Ready in half an hour. PRE-HEAT the oven to 200 degrees celsius or 390 degrees fahrenheit. UNFREEZE the spinach if you’re using frozen spinach, if you’re using fresh spinach make sure they’re properly washed. We will create 2 different types of quiches, one kind is suitable for vegetarians. That’s why we use 2 separate skillets instead of just one. UNFREEZE the puff pastry if necessary and use a rolling-pin to flat them a little bit. This way you can use 1 puff pastry sheet (square) for 2 mini quiches. USE a brush to coat the muffin tin with a little bit of olive oil. DIVIDE all the puff pastry over the muffin tin and use a sharp knife to remove the excess dough. Finely CUT the onion and garlic clove. RINSE the leek and slice into thin slices. Also cut the sun-dried tomatoes into strips. HEAT a bit of olive oil in both skillets and add onion and garlic in one, bacon and leek in the other. After about a minute, add the spinach and sun-dried tomatoes to the onion and garlic. Season with pepper and salt, but keep in mind the bacon doesn’t need any extra salt. Now both fillings are done. USE a fork to poke a few holes in the bottom of the puff pastry. FILL 6 of the quiches with the bacon and leek mixture and the other 6 with the sun-dried tomatoes and spinach mixture. In a medium-size bowl, COMBINE eggs and cream and mix well with a whisk. DIVIDE mixture over the 12 mini quiches, about 3/4 full. CRUMBLE the goat cheese on top of the quiches and bake them in the pre-heated oven for about 10 minutes. Or until the goat cheese is melted and the puff pastry is done. 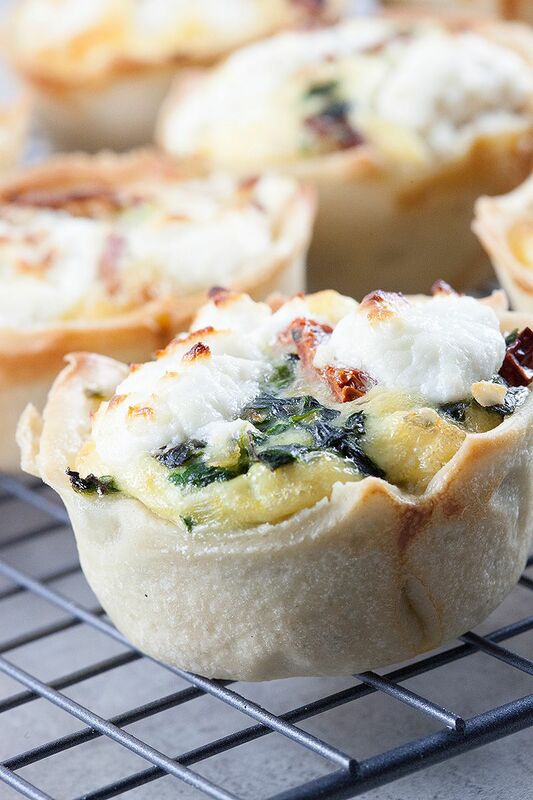 Pretty little quiches. They’re so tasty and versatile as well.